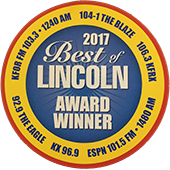 In communities like Papillion, Gretna, Fremont, Council Bluffs, and Omaha, Andy’s Appliance Repair is becoming more and more well known for our commitment to providing exceptional customer service. With an appliance repair center centrally located in Omaha, we have an inventory full of thousands of parts on major appliances. Which kind of appliances, and which brands do we service? That’s a fantastic question. Among our extensive list of major appliances brands of which we have replacement parts (and repair, naturally) are Whirlpool, Maytag, Bosch,, Samsung, GE, Dacor, Viking, Sub-Zero, Miele, Fisher Paykel service, Electrolux service, Frigidaire repair, Subzero appliance repair, Kenmore, Sears, LG, GE appliance repair, Scotsman, Asko, Jennair repair, and many more! We didn’t feel like filling up the entire post with a laundry list of brands, so suffice it to say that it doesn’t matter if your appliance in question is under warranty or not, or if it is old or brand new. 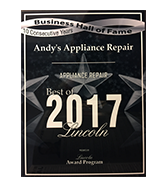 At Andy’s Appliance Repair, we have a Factory Certified staff who are award winning in the city of Omaha, so all you need to do is call us for what will likely be same day service. We do our best to fit you in our schedule as quickly as we can, because we understand how needing to get your refrigerator fixed can throw your life upside down at a moment’s notice. In reference to the actual appliances that we service, among them are dishwashers, washing machines, clothes dryers, wine storage units, refrigerators, ovens, microwaves, other small appliances, built-in coffee machines, freezers, cookers, stovetops, and pretty much any kind of appliance you might own. The odds are we have the replacement parts and the know-how to fix whatever the issue is. But what if the issue is beyond repair? How do you know when to pull the plug, if you will, on your refrigerator? Buying a new major appliance can cost a small fortune these days, whereas getting kitchen appliance repair from a local appliance repair company like Andy’s will set you back significantly less. Either way, it’s not exactly fun. 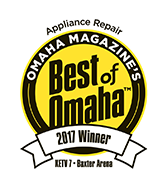 This post is dedicated to helping our Omaha community residents decide whether replacement or appliance service repair is the better option. Obviously, each situation is going to vary to some degree, but that doesn’t mean there aren’t some helpful tips that can aid you in your decision making. Read on if you would like to be behooved! The fact of the matter is that if you want to function in modern society, you’ll need to have at least a few home appliances. We would be very surprised if you didn’t already have a couple, bare minimum. When they break, there are multiple variables in play when it comes to deciding on repairing versus appliance replacement. If your refrigerator was built around 20 years ago, there is a good chance that you would be able to halve the energy used by purchasing a modern, energy-efficient refrigerator. In that way, getting a new refrigerator might eventually make the purchase worth your while. Plus, the odds are that your new unit will look much better than the old one, and perhaps even match with the rest of your place. But saving hundreds, over the course of a few years, on your energy bill while you spend thousands on a new fridge might not be the best choice if you aren’t financially able to do it. We recommend looking into appliance brands with the best track records of longevity. This one is fairly obvious, but it is certainly still worth mentioning. If you have a unit that is still under warranty for repairs, then by all means, take advantage of that manufacturer warranty. The reason why we mention this is because often people don’t know if their appliance is under warranty or not. Check your owner’s manual for details, but the general rule of the industry is that parts and labor for your major appliance will be covered by the manufacturer for a full year, sometimes two. The beauty of the warranty is that you won’t have to pay for a replacement, and the repair is free! You’ll still need to get your appliance repaired, which can be an arduous process. 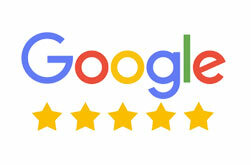 But remember, at Andy’s Appliance Repair, we excel at being fast, high-quality, courteous, and affordable. Age is a factor worthy of consideration when determining if you should repair or replace that washing machine or clothes dryer. Pretty much every appliance that you own has something called an average useful life. This term has to do with the average lifespan most machines of that brand and model run for. Anything after that average useful life could be considered something like borrowed time, so it’s probably a good idea to start planning for a replacement, or at least a repair, on that appliance once your average useful life has been reached. But the key point here is that if you are determining whether repair or replacement is the right option for you, the closer you get to that average useful life the wiser a full-on replacement becomes. Why? 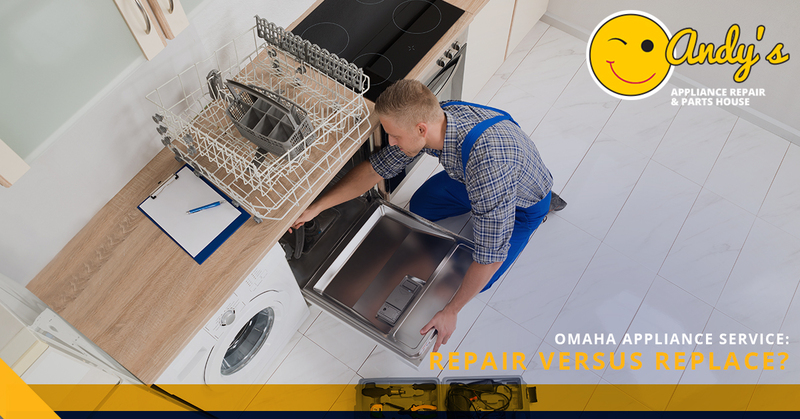 It might be the case that even if you get quality, affordable appliance repair (from a trusted Omaha company like Andy’s), a different part of your major appliance might break down. There are a lot of working parts, which unfortunately means there are a lot of things that can go wrong. In reference to having the same part break over and over again, you don’t have to worry about that hypothetical when you get your appliance repair or replacement parts from Andy’s. We guarantee all work done for a full year. Not much is more frustrating than hidden or extra costs. It might be the case that replacing your appliance will turn out to include much more than the initial price of the new machine. It’s not unheard of to hear about people spending more money on extra charges than on the appliance. How so? Excellent question. One example of this frustrating occurrence is when you need to carve out a new space in your kitchen for a refrigerator, oven, or dishwasher. Altering your cabinets just so you can squeeze in your fridge is an unforeseen calamity which happens all too frequently, in our estimation. Another example of this principle is upgrading from a gas stovetop to a fancy electrical range. You will likely need to add new circuitry and wiring, and nobody wants to do that. That latter example won’t likely set you back thousands, but it is an added expense which you should be aware of. Another variable in this repair vs. replace equation is if you are planning on moving anytime soon. If you are planning on staying in your current place of residence for more than 10 years, then electing to replace might turn out to be the best decision. If you are planning on changing abodes in the moderately near future, it probably isn’t the best decision. Having new appliances are certainly convenient, but it isn’t likely to add thousands to the value of your house when you are looking to put it on the market. We hope that this has been a helpful article that has sufficiently behooved you in getting a mental framework for when you’ll be needing to replace your major appliances. Unfortunately, we aren’t miracle workers here at Andy’s Appliance Repair & Parts House, meaning that eventually you will need to get a new washing machine or ice maker. But don’t despair! Appliances often have long lives, and with affordable appliance repair from Andy’s, you’ll be able to extend the lifespan of a variety of domestic appliances. If you are interested in quality home and kitchen appliance service, schedule your online appointment today!